The EMEE EuroVision Laboratories (EuroVision Lab.s) aim at the implementation of the Change of Perspective (COP), the underlying concept of the EMEE project, into museum practice. In order to bridge the gap between research and practice, the EMEE-team Augsburg cooperated with different museums, but also with other institutions focusing on European cultural heritage. In a close collaboration between the Augsburg coordinator (University of Augsburg) and its workgroup partners, the ideas and outcomes, developed in the scope of EMEE, were implemented and evaluated. Below follows the concept of the EMEE EuroVision Lab. Augsburg, a description of its elements and the conclusions and so-called ‘lessons learned’ which evaluate the EuroVision Lab. experiences of the Augsburg EMEE-team. 1) The EMEE-team Augsburg supported the Kunst- und Kulturmuseum Dortmund and the City Museum Kaufbeuren which encouraged the visitors to take a more active role in the museum, by co-curating special exhibitions (Change of Perspective 2). 2) In the City Museum Marktoberdorf, the EMEE-team focused on the ideas of re-interpretation and presented selected examples of museum objects with regard to their trans-regional and European contexts. The Augsburg EuroVision Lab. aimed at offering the EMEE concept to smaller regional city museums by accompanying the planning and development of their EuroVision Lab. activities. Further on, the Augsburg team spread the ideas of EMEE, and especially the concept of the Change of Perspective, by organizing lectures and workshops in co-operation with institutions and organizations working in the field of initial and continuing qualification for museum experts and cultural workers, even history teachers. Among the partners were e.g. the Bayerische Museumsakademie, the scientific panel Forum Musealisierung at the University of Augsburg and Euroclio, the European Association of History Educators in order to ensure the project’s sustainability beyond its official lifetime. The public lecture series dealt with the idea of museums as Social Arenas by discussing current viral museology topics on site. Seven international experts from various disciplines in the field of museum studies offered lectures followed by a discussion with the audience. The lecture series was aimed not only at university students and museum experts, but also at the general public interested in the future of the European cultural heritage. All lectures tied on topics relevant within the EMEE project, focusing on the implementation of its main concept, the Change of Perspective. Especially the question of how audiences could be involved more strongly into the museum work and thereby how to initiate a switch of roles between heritage professionals and museum users was discussed in the lectures of Doris Hefner M.A., Léontine Meijer-van Mensch and Isolde Parussel M.A. The scenographer Dip. Arch., M. Phil. Tom Duncan discussed new ways of staging cultural heritage, Dr. Udo Gößwald presented new perspectives on museum objects and Prof. Neil Forbes and Prof. h.c. Dr. Hans-Martin Hinz informed the audience about new challenges in the field of European cultural heritage. Cultural Heritage Controversial – Challenges for Museums in the 21st century. Poster of the EMEE EuroVision Lab. lecture series. Prof. h.c. Dr. Hans-Martin Hinz, President of the International Council of Museums (ICOM), opened the public EMEE EuroVision Lab. 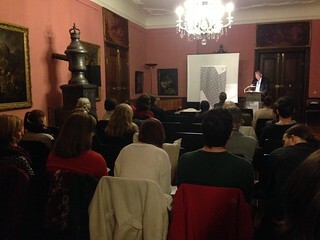 lecture series at the Schaezlerpalais Augsburg. 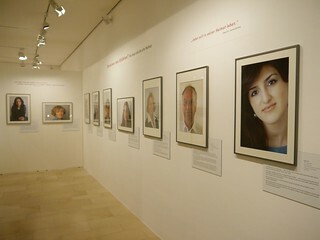 To attract a wider audience, the museum made it possible to open its exhibition for free for visitors of the lectures. The special exhibition ‘The Münsterstraße. Dortmund’s colourful pavement’ was one part of the EMEE-Lab. activities in Dortmund. The exhibition took a closer look at one of Dortmund’s biggest and most colourful streets. Especially the topic of migration, of arriving and leaving, which has a high importance as a transnational topic, was addressed. Using topic areas and single house numbers, an insight into the history and development of the street and its importance for the development of the city was given. Residents were asked to share their stories and to hand in fascinating objects that shed a new light on the Münsterstraße. The EMEE Toolkit 2 ‘Integrating a multicultural Europe. Museums as Social Arenas’ and the EMEE Toolkit 3 ‘Bridging the gap. Activation, participation and role modification’, which are both dealing with the EMEE concept of the Change of Perspective regarding the activation of the museum visitors (COP 2), laid the foundation for these EMEE EuroVision Lab. activities. The activation and participation of visitors (Change of Perspective 2) was mainly relevant for this special exhibition, as the museum reached out to the citizens and invited them to actively participate in the designing of the transregional exhibition’s content by sharing not only their stories but also by enriching the exhibition with their personal objects. 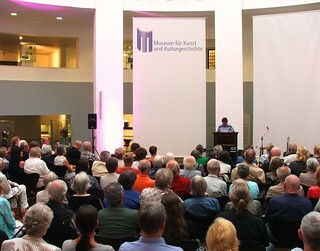 Opening ceremony of the special exhibition ‘The Münsterstraße. Dortmund’s colourful pavement’ at the Museum für Kunst und Kulturgeschichte Dortmund. The co-curated exhibition ‘The Münsterstraße. Dortmund’s colourful pavement’ displayed objects handed in by the residents of the Münsterstraße and offered new perspectives by telling their individual stories behind the objects. Furthermore, in a monthly presentation of the ‘object of the month‘, the Museum für Kunst und Kulturgeschichte Dortmund visualized their innovative re-interpretations of museum objects, which unveiled their European contexts for the first time. One example of these European objects of the month is a souvenir drinking glass from Dortmund, which presented a picture of the Dortmunder Fredenbaumpark. All over Europe, the emergence of these souvenir glasses with typical prints of local buildings or places of remembrance are existing. This typical souvenir glass was manufactured around 1900 and came from Offenburg, Palatinate back to Dortmund in 1997 (for details and further information please see below ‘Parussel, Isolde: Objekt des Monats September 2015. Souvenirglas Fredenbaum’). The core idea of the multilayered re-interpretation of the museum objects was developed with the help of the EMEE Toolkit 1 ‘Making Europe visible. Re-interpretation of museum objects and topics’. Dortmund presented its results in a special display case at the entry of the museum, a space, which is accessible without entrance fee, to attract also so called ‘non-visitors’ to the new interpretation of objects. The topic of flight and expulsion was presented by a touring photo exhibition about personal stories of migration in the City Museum Kaufbeuren. It was expanded by stories of migration narrated by members of local communities, which presented their own flight and expulsion experiences and shared their views on Kaufbeuren and the city museum. This participatory project was implemented by a group of citizens of Kaufbeuren, who all had some migration experiences in common. This special focus group of the city museum evaluated how the topic ‘migration’, which is a genuine transregional/ European topic, was represented in the city museum and then analyzed in a second step how the city would look like without migration. This project dealt with EMEE’s Change of Perspective 1 and 2, the ‘Europeanization’ of museum objects (COP 1) and the modification of roles between visitors and museum staff (COP 2). The project group slipped into the role of museum curators and brought aspects of a socially viral topic into the museum that has not been displayed like this before. Moreover, they also designed some participatory elements in the special exhibition, which should animate the audience to share their views on the city as well. This kind of co-curation combined the ideas laid down in the EMEE Toolkit 2 ‘Integrating a multicultural Europe. Museums as Social Arenas’ with the EMEE Toolkit 3 ‘Bridging the gap. Activation, participation and role modification’, to create new transdisciplinary, transregional and European views on familiar topics and to attract also so-called ‘non-visitors’. A glance in the co-curated special exhibition ‘Continuing the history of Kaufbeuren’ at the city museum, where citizens of Kaufbeuren presented their personal view on ‘their’ city and tried to explain, how the city would look like without migration. The EMEE-Lab. exhibition asked ‘what would the city Kaufbeuren miss without migration?’ The answers were presented at the co-curated Lab. exhibition. The City Museum Marktoberdorf approached the topic of ‘Europeanization’ of the museum objects by presenting an article series called ‘European object of the month’. This article series, published in the local newspaper, introduced the idea of ‘Europeanization’ of museum objects and museum presentations. ‘Europeanization’ means that the European dimension of the collection/ exhibition inventory is made visible by suitable objects and topics, whereby the multi-layered meanings reaching from local to regional and national to European and global. One example of the ‘European object of the month’-series is the presentation of the museum’s own collection of pilgrimage objects. These objects are quite relevant for the area the City Museum Marktoberdorf is located in, because pilgrimages were quite common in this area and are still a ‘living cultural heritage’. But the citizens not only went on pilgrimages to nearby places, they also went to far off destinations like Lourdes in France. An indication of this are the small souvenirs which traveled – or ‘migrated’ – with the pilgrims back to Marktoberdorf and which are now part of the collection of the City Museum Marktoberdorf. On this basis the museum experts developed the exhibition ‘Europe in Marktoberdorf’ to show the entangled history of museum objects. Most of the museum objects were – in contrast to the Madonna from Lourdes – ‘typical’ local Bavarian objects. Their multilayered meanings were presented in the EMEE Lab. exhibition. The essential idea for re-interpretation of the local museum objects were laid down in the EMEE Toolkit 1 ‘Making Europe visible. Re-interpretation of museum objects and topics’. This EMEE Toolkit presents ideas, how presentations of local museum objects, usually seen in a monoperspective regional way, could be transformed into a presentation dealing with transregional, European contexts, by offering eight different categories. These categories offer various approaches which are supposed to facilitate the identification of museum objects with transregional European references. 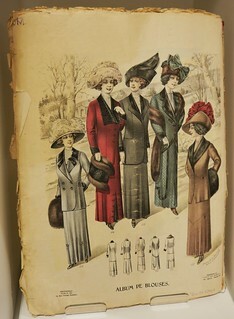 For this purpose, many objects out of the extensive collection were presented to the public for the first time. Nine different accesses – ranging from fashionable, artistic and religious traces to trading connections and traces of migration – provided the framework for the multi-perspective presentation of the regional objects, which revealed their European history in this special exhibition. In close co-operation with the Bayerische Museumsakademie, the EMEE-team Augsburg organized the workshop ‘Europe in Museums – a Change of Perspective’. Starting from the premise that museum objects carry multiple layers of meaning and can reveal unexpected transnational and cross-cultural European dimensions the workshop invited museum professionals, history teachers and students to discover diverse ways of re-interpretation. Furthermore, the topics ‘museum as Social Arenas’ and ‘social media for museums’ were discussed. With this co-operation, the EMEE project had a very important, relevant and well connected partner: the Bayerische Museumsakademie was founded by the Chair of Bavarian History at the Ludwig-Maximilians-Universität Munich, the Landesstelle für die nichtstaatlichen Museen in Bayern and the Museumspädagogisches Zentrum to focus on professional development of museum experts, professionals in other institutions of cultural heritage, teachers and future teachers and also students. The EMEE-project team Augsburg prepared several workshops where multipliers came in touch with the ideas of re-interpretation of museum objects. The workshops were aimed at museum experts and also at university students and presented the different approaches to museum objects exemplifying some best practice examples. ‘Social Arena. Museums, (non-)visitors and their communities’, presented by the EMEE-partner National Museum of Contemporary History in Ljubljana, Slovenia, in close co-operation with the academic group ‘Forum Musealisierung’ at the University of Augsburg in June 2015. Furthermore, the idea of EMEE and the Change of Perspective was presented to several co-operation partners, for example at the 1st regional ‘”History that connects” Summer school. Rethinking on-site learning to find the global in the local’ organized by Euroclio, the European Association for History Educators (http://euroclio.eu/) at Šipovo, Bosnia and Herzegowina in August 2015. Mainly history teachers, but also experts in the field of museums and cultural institutions attended and discussed the implementation of EMEE and the Change of Perspective in former Yugoslavia. Moreover, the EMEE-project was presented at various conferences such as ‘Multiple Memories’ (Zukunftsakademie Nordrhein-Westfalen, 05./06.12.2014, Duisburg, Germany), the final conference of the EU project ‘European Museums in an age of migration’ (MELA) (21.01.-23.01.2015, Milan, Italy) and during the Designmonat Graz (May 2015, Graz, Austria) as well as during the conference ‘Una prospettiva internazionale per i musei europei. Il progetto EMEE – EuroVision Museums Exhibiting Europe’ (19.02.2016, Rome, Italy). Via presenting the concept of EMEE, especially the Change of Perspective, to a wide range of museum experts, students and teachers, EMEE is on the best way to be sustainably implemented into museum practice. The Augsburg EMEE-team prepared two university seminars, where multipliers and future museum experts came in touch with the ideas of re-interpretation of museum objects, laid down in the EMEE Toolkit 1 ‘Making Europe visible. Re-interpretation of museum objects and topics’. The university seminars ‘Cultural Heritage controversial – Challenges for museums in the 21st century’ (winter term 2015/2016) and ‘Change of Perspective – New approaches for museum development of local museums’ based on the EMEE Study Module (summer term 2016), dealt with how cultural heritage can be presented and made accessible for heterogeneous audiences and offered the innovative ideas of re-interpretation of museum objects to future museum experts. Furthermore, the university seminar ‘Making Europe visible. Re-interpretation of museum objects and topics’ was accompanied by a public lecture series offered in co-operation by the Chair of History Didactics at Augsburg University and the Kunstsammlungen und Museen Augsburg. 2. to re-design the roles of museum experts and users. For the museums the University Augsburg worked with, the EuroVision Lab. was experienced as a support in getting started with the Change of Perspective that enables to ‘Europeanize’ collections, by using different focuses (on re-interpretation or role-modification) and to attract new focus groups. The concept of the Change of Perspective moreover has been evaluated as a very helpful tool as it provided a wide range of useful ideas to implement ‘Europeanization’ via the eight different re-interpretation categories (Toolkit 1) in the City Museum Marktoberdorf and ideas for implementing Social Arena and Bridging-the-Gap measures (Toolkit 2 and Toolkit 3) in the StadtmuseumKaufbeuren. Especially the international network of museum experts connected to the Augsburg teamwas evaluated as a strong support for the implementation of the re-interpretation and ‘Europeanization’ of museum objects (Change of Perspective 1) and the activation and participation of visitors (Change of Perspective 2): The experiences of the internationally well-known partners were very valuable for designing the Augsburg EuroVision Lab. Especially the international lecture series profited from the strong international EMEE-network, including internationally well-known lecturers that presented their perspectives on the future of cultural heritage in the 21st century towards European and global perspectives. The transnational and interdisciplinary EMEE Augsburg network was the foundation for the collaboration with regional museum partners and further cultural and heritage institutions. The close co-operation strengthened the exchange between the EMEE-project and the workgroup members and further joint projects are envisaged. As an example, a closer co-operation with the ‘Landesstelle für nichtstaatliche Museen in Bayern’ (http://www.museen-in-bayern.de/die-landesstelle/die-landesstelle.html), which is the first point of contact for more than 1.250 different museums and places of cultural heritage in Bavaria, is planned.